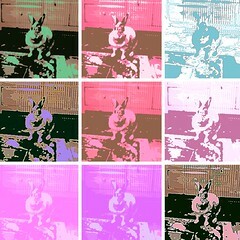 just fooling around....betcha didn't know Chelsea posed for Warhol!!!! Just spent three hours sitting on my bathroom toilet. This morning I got into the bathroom and shower and out again with no incident. The fact that I was so weak so early in the afternoon is a mystery. I was so strong this morning, and I ended up crying out of sheer frustration. Poor Ellita had to use the porter’s bathroom in the basement while I sat waiting for my second wind, which never came. So we enlisted the doorman’s help again. Now we have to limit bathroom trips to morning shower. I can’t take the risk of getting stuck or, worse, falling, I am so frustrated. I had a bad couple of days last week where I just didn’t have the strength to get into the tub. Twice last Wednesday I had to be taken off the floor by the aides and my doorman because I got stuck in the “no-man’s land”, that passageway into my bathroom that won’t fit a wheelchair, and only fits one person. The aide held me up as long as she could, and then for the safety of both of us, I had to drop to the floor. You can’t pick up a person with muscle weakness by the arms or legs, because there isn’t that muscle support around the joints, and you can dislocate a limb. Next time you eat a chicken, look at the hips and legs, and you can see what I mean. So I had to be lifted from the torso. For the next day, Ellita and I worked out a strategy whereby she would wash me down and we would go to the hair salon every few days for a shampoo. But by Friday we both figured out that if I took the few steps into the bathroom slowly, resting between each step, I could do it, And I can’t make that turn into the shower right away; I have to sit on the toilet and rest for a few minutes. I had gotten back the Mercury talking device, but it had a whole new problem. So Ron came and fixed and I have my fingers crossed it will behave. So now I can pack the ALSA loaner up in the box and send it back. Olga the Respiratory Therapist came to adjust the portable vent. I figured out that I just have to carry a little piece that goes in my nose, in my bag. Hooray! Louise asked me why I didn’t ask her to take me to the Murphy’s for July 4th and I said that I knew she always goes to a barbecue with the people from her church. So she said that she will forego that, and go with me! Jeanellen actually rented a handicap-accessible port-a-potty --- I never knew there was such a thing. I am going to join SATH.com. That is an organization that specializes in travel for the disabled. Even if I want to go to a friend’s house upstate, I could use them for something like handicap-van rental, or wheelchair rental on the other end. I proposed to Sue Zimmerman, the ALSA social worker to work with the new social work intern on a manual of resources for people like me, who have care and equipment, but can’t work anymore, and want to live our best lives with ALS. Sue is pitching the idea to Adele Marano of ALSA. I was dwelling too much on those near and dear to my heart that I didn’t see around my birthday, that I wasn’t focusing enough on whom I DID get to see. I am so grateful to Jen and Judy, who came last Sunday to with a birthday cake and some gifts – a Starbucks card, Lindt truffles, and shower gel from Bath and Body Works. On the night of my birthday, I went to Appleby’s with Louise and had one of those alcoholic dessert drinks, which was more dessert than alcohol. And we shared this dessert thing, which was like a hot apple crisp with ice cream. I got cards from Debbie, Michelle Auletta and others. Even Gulshan brought me some Pom juice and Indian sweets. On my birthday, Ellita bought me dinner, and she bought me some body spray and lotion from Victoria’s Secret. Cheryl, her mom, bought me shampoo and conditioner from Victoria’s Secret. Norma sent a blast e-mail to everyone in the ALS community telling them it was my birthday, so I got literally about 100 e-mails. Lynette’s first husband, and father to her eldest kids, died 2 weeks ago and she had to make an emergency trip to Guyana, so Gulshan has been working every single night since June 1. Although she was a trooper about it, I know it was difficult. Lynette came back to work last night and she had had her wallet stolen, so she was not a real happy camper. And finally, there is one thing worse than not being invited to a Fourth of July. It’s being invited to a celebration I can’t get to. I am invited to Jeanellen’s family annual Fourth of July bash out in Eaton’s Neck and I can’t get there. I don’t think anyone will be able to drive with me, and the LIRR station is nowhere near there. I was invited to the Yankees game on ALS Night but it came in the middle of the aides’ shift change, so I couldn’t work it out. It is all so frustrating that, when I DO get invited somewhere, I have to depend on other people to get me there. It makes me so angry to lose my independence. Dr Scelsa, Neurologist Interestingly, my strength has not changed much. He said I may have lost a little strength in my right hand, but negligible. I showed him the stiffness in my left hand and he said there is not much I can do except flexibility exercises. I am apparently still upper-motor-neuron dominant – closer to PLS, or Primary Lateral Sclerosis. I don’t have the muscle atrophy of lower-motor-neuron disease, so I do not have classic ALS. My muscles in my back are weak so I can’t sit or stand straight for very long. And I have heavy bulbar involvement which affects speech, chewing, and swallowing. Betsy, Respiratory Therapist She ordered a portable ventilator, which goes on the back of my wheelchair, She didn’t order the car adaptor because I am rarely in a car, but there is a battery pack so I can use it when I’m out, because I am increasingly out of breath during the day, and I can’t travel with the bi-pap, which needs to be plugged in to an outlet. She also adjusted the setting on my bi-pap so I wouldn’t get those carbon-dioxide headaches I have been getting. Dietician I was bummed to find out that I only lost 6 pounds, so she said I can cut down to 2 cans of food through my tube every day and take in more fruits and veggies by mouth and make sure I hydrate through the tube. Social Worker and Occupational Therapist: Nothing more they can do for me. I have my insurance coverage and all assistive equipment. As a matter of fct, my clinic visits are more spaced out now. I don’t go back for four months, instead of the usual three. I got my portable ventilator this afternoon but now I have to have a platform put in the back of my wheelchair for the battery pack. I am really going to scare people now. It was my birthday yesterday, so let me just say that I can't believe another birthday has gone by. Life can change in an instant -- a sudden illness, accident, anything can happen. We all never know which birthday will be our last; this is true for everybody. In Januar, 2004 I was told I have a fatal disease and most likely had 2-5 more years left. But so many people are dead in an instant, without any warning at all, or fall ill and are on the road to death from then on. So I am grateful I was given the gift of timw. Because ecen with ALS, I have seen others diagnosed after me who are already gone. We all have to be thankful we are here today. So Tuesday was kind of preparation for The Hill. First, we attended a meeting about what to expect. I could tell from the talk that, as I expected, DC Advocacy was going to be big and impressive. After the prep meeting, there was another seminar on recent advances in research. Of course, the topic of stem cells came up. As I suspected, stem-cell research is our biggest hope for a cure and/or better treatments. On Tuesday evening, we attended an awards presentation at the historic Carnegie Library. There was also a reception with a baseball-park theme. Each section of the buffet was divided into regions, and typical ballpark food was displayed, including regional specialties. So, among the hotdogs and French fries, were pizza for New York, cheesesteak sandwiches for Philadelphia, and nachos and fried churros for San Diego, and clam chowder for Boston. And hostesses passed through with baskets full of bags of Cracker Jacks, and Baby Ruth candy bars. It was a lot of fun. Wednesday morning we woke up at 5:00am, for the day on The Hill. After breakfast at the host hotel, the Renaissance, we boarded buses for the buildings where the senators and Representatives have their offices. There was a lot of walking, or rolling in my case, from one building to another. Our first stop was the Cannon Building to meer Carolyn McCarthy from the Fourth Congressional District on Long Island. Even though I do not live in her district, my family does, and of course, her district is where I am from. McCarthy’s rise to Congress was out of a tragic story, one that was a big part of our history here. On December 7, 1993, as a Long Island Railroad train full of commuters from Manhattan, pulled into the Merillon Avenue station in Garden City, a crazed gunman by the name of Colin Ferguson opened fire in one of the cars. Two of his 25 victims were Dennis McCarthy and his son Kevin. Dennis was killed, along with five others; Kevin was one of 19 injured. As a result of her husband’s murder and son’s severe injuries, Carolyn, then a nurse, became an activist for gun control. Thereafter, she ran for Congress, and there she still sits. She greeted us very enthusiastically, and listened to our presentation, including my story that I had pre-typed and saved in my Mercury speaking device. We took pictures, which she promised to send us. I told her what an inspiration she has been, and she told me how inspired she was by my presence in her office. As a followup, I contributed an entry on Metroblog NYC called “Carolyn McCarthy Rocks!” and somehow it came to the attention of Peter Kay, her Legislative Assistant, and he e-mailed to thank me. He said McCarthy was “tickled” to read my article! Then, we were off to see Anthony Weiner, the Representative from my, and Louise’s district. Weiner is one of the sponsors of the ALS Registry Bill, which he quickly reminded us of while he whizzed by in the hall. We got to do our presentation to Weiner’s aide, and also to the aides of Hillary Clinton and Chuck Schumer, our two senators. We were pretty exhausted by the time we arrived at Union Station for our 7:10 train. Ellita and I had some dinner, and we boarded the train with Jody and Maria. We had an Access-a-Ride pickup scheduled for 10:21 at Penn Station – well in line with our scheduled arrival of 9:45. Well, as luck would have it, our train met with a mishap; sometime after Philadelphia, we smelled a fire. Some debris on the tracks caught fire and our train was badly delayed. We then knew we were going to lose Access-a-ride! So Jody used her power of “ big mouth” and requested that they send another van. Of course they wouldn’t confirm it to us. Long story short: I got to Penn Station, sent Ellita home in a taxi, while Jody and Maria Castronovo waited with me until Lynette arrived from my house in a taxi. I had no idea that taxis had gotten so expensive! Just ten years ago, I took taxis from Manhattan to Queens for under $20 and now they are more than $40!! Lynette arrived at Penn at 11:45, and we received a confirmed time for Access-a-Ride pickup of 1:00am. They arrived at 1:15, home at 1:45, to bed at 2:15am. I don’t think I need to say how exhausted I was the next day, but it was all worth it, and I can’t wait to do it again. NEXT UP: Fern’s Fighters, Talking Machine battles, etc.